The key switches that we supply are all designed for a life outdoors and will be happy in a 12 volt or 24 volt system. If you do not see a switch that you like and would like us to fit a switch that you have purchased we will be happy to quote you for this service. This is our standard single action key switch. It will be wired so that when you switch it on all the panel elements will be energized. Retro Key switch with Pre-Heat. This is a retro key switch with pre-heat function. The construction is of galvanized or painted steel, plastic and brass. Giving a robust long lasting design that has not changed for decades. Position 1 = Ignition on. 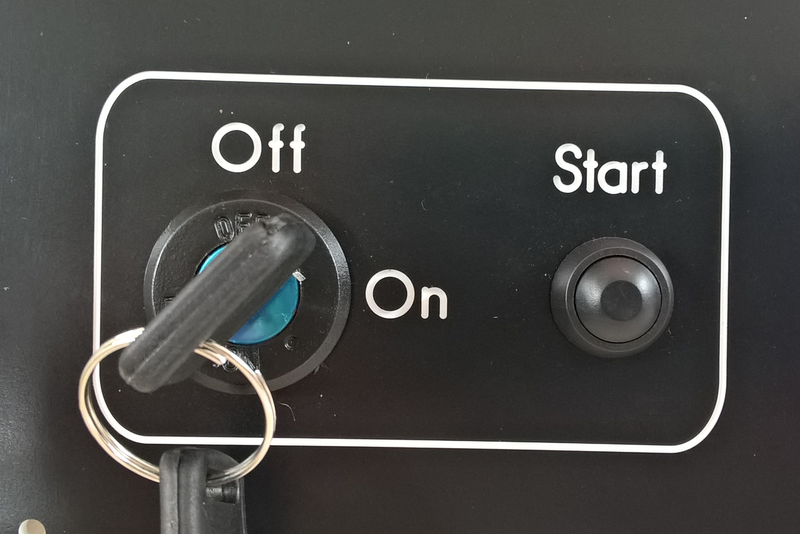 As there is no 'Hold' position for pre-heat and start we fit two warning lights with this switch so that you can see when the key is in the correct position. This out three position key switch which can be ordered with or with out the rubber cover. The switch can be turned to the left into the AUX position. Once in this position the switch will be wired to energize any switches that you have on your panel. There is a spare lug at this position. Turning the key to the right puts the switch into the ignition position. We will wire the switch so that now all the things under the AUX control are still available and all your gauges are powered and any heater switches are energized. There is a spare lug at this position. ​Turning once more to the right energizes the start lug on the rear of the switch. Once you let go it will drop back to the ignition position. Many modern direct injection engines require no preheat function so the key switch above is fine. Some however require a short heat or prime function. We can install printed circuit/s that will allow a auto preheat cycle for ten seconds once the ignition is on that will sound a buzzer / light or both and engage a 30amp relay for you to connect to. For engines that require the diesel pump to pressurize before starting we can install a circiut that will delay starting and sound a buzzer / light or both for ten seconds before engaging a 30 amp relay to allow starting.